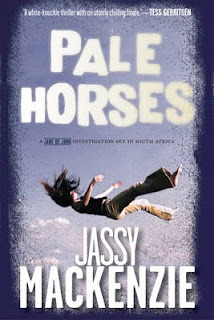 PALE HORSES is the fourth in Jassy Mackenzie's series of thrillers featuring Jade de Jong, South African PI. The book opens in an upscale cafe in Sandton, a very wealthy suburb of Johannesburg. Jade is still traumatised by events that took place in earlier novels in the series, but is persuaded to take on a case brought to her by the geeky millionaire trader Victor Theron. Theron has recently lost a friend, Sonet Meintjies in a suspicious extreme sports incident - Theron and Sonet were basejumpers, illicitly taking parachute jumps from high buildings without the owners' permission. Despite Theron checking Sonet's parachute for her before the jump, for some reason Sonet's parachute didn't function, resulting in her death. Theron is keen to avoid involvement and bad publicity in any homicide investigation resulting from the incident and hires Jade to uncover the truth about this incident. Jade investigates the accident scene, and Sonet's personal and professional life, to uncover the truth. Sonet worked for a charity, Williams Management, that helps small rural communities set up sustainable crop farms. One of these farms included that formerly owned by her ex-husband, the embittered Van Schalkwyk, in Theunisvlei, subject of a successful land claim by the Siyabonga tribe. Jade's search for the truth leads her from Johannesburg to the depths of the Karoo. In the meantime, we see events through the eyes of Mrs Kumalo, widow of a man who worked on the farm at Theunisvlei, who took a job as housekeeper/chef for a wealthy Johannesberg man, but is being forced to act as driver for a shady criminal. Jade is a reasonably sympathetic heroine, resourceful and with a strong sense of justice, if somewhat prone to impatience with those who get in the way of her investigation. Despite the deceptively gentle start, in the cafes and luxury tower blocks of Sandton, this book shows the danger and violence of carrying out investigative work in South Africa, and provides an interesting view of contemporary issues in South Africa in the post-apartheid era, including the operation of agribusiness and GM multinationals. Jassy McKenzie doesn't stint from showing the violence of those who were responsible for Sonet's death, and from showing how Jade herself has to resort to violence to protect her life and that of innocent witnesses. Jade's on-off relationship with Superintendent David Patel features in the latter half of the novel, and is the one slightly unsatisfactory note to this novel, particularly the subplot involving anonymous letters to Patel. It feels somewhat incongruous to have a romantic theme whilst Jade is dealing with all this violence around her, though admittedly the relationship is a useful plot device to allow Jade good police connections where necessary and to let us see a gentler side to Jade. Overall I found this a very enjoyable and surprisingly readable book, managing to be an intelligent pageturner. This book works well as a standalone, with the caveat that it does contain some significant potential spoilers about earlier books in the series.